There’s been a rollicking online debate the past week on the subject of “slow transit.” Matt Yglesias at Vox and Yonah Freemark at Transport Politic noted the downsides of two transit projects — the DC streetcar and the Twin Cities’ Green Line, respectively — arguing that they run too slowly to deserve transit advocates’ unqualified support. Robert Steuteville at Better Cities & Towns! 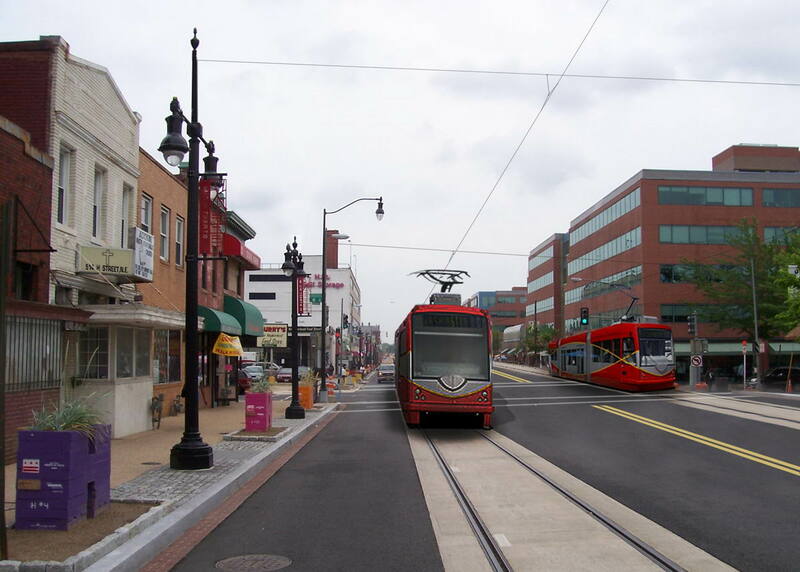 — a publication of the Congress for New Urbanism — responded by defending slow-moving streetcars, saying they help create walkable, mixed-use neighborhoods that make fast, long-distance trips less necessary. Then Jarrett Walker ran a response from a Human Transit reader questioning whether streetcars are a worthwhile way to achieve Steuteville’s goal of increasing access to a wide range of destinations. By trying to maximize connections to the community, the transit line has to stop more often, slowing speeds. And if built into a legacy urban fabric, this also includes negotiation with tons of cross streets where designers don’t give priority to the transit line. This happens in Cleveland on the Health Line BRT as well as the Orange Line in Los Angeles, even though it has its own very separated right of way. The Gold Line Light Rail in LA and the Orange Line originally had the same distance, yet one was 15 minutes faster end to end. A lot of this had to do with less priority on cross streets given to the Orange Line, not because it was a bus or rail line. However for linear route based transit operations, we need dedicated lanes and signal priority to at least make the expenditure worthwhile and play nice with our urbanism. Once you get outside of a district, people want to get places. I like subways and wish we had more, but it seems politics and money seem to get in the way like Yonah mentions above. Some might even argue that before we even think about building fixed guideway lines, we should focus on our buses. Perhaps we should have a threshold system ridership before putting in rail, to determine whether all options for increasing ridership have been exhausted. Houston’s new network plan could be a good guide. And personally, I don’t think BRT should be special. It should be the norm. There’s a lot more in Jeff’s post — it’s a great read and worth checking out. Elsewhere on the Network today: Transportation for America responds to the last-minute Senate deal to avert federal transportation funding insolvency. Systemic Failure reports that a legally blind Oakland man has been given a slap on the wrist for getting behind the wheel and killing a pedestrian. And Bike Portland comments on the city’s ongoing downtown sidewalk biking sting. Local government ceded decisions about the project to private benefactors, subordinating public goals to their interests and preferences.